You are going to visit medieval city of Kotor, and you need a taxi from Podgorica airport to Kotor? We can proudly say that you are at the right website! We are taxi company in Podgorica - Montenegro, and and transportation from Podgorica airport to Kotor at fixed price 55 Eur is our every day activity. Kotor is old Mediterranean port surrounded by fortifications built during the Venetian period, and it is a part of World Heritage Site. Taxi is the best way of transfer service from Podgorica airport to Kotor, because from us you will get safe and reliable service at an affordable price. Kotor is a centre of Kotor municipality, but taxi from Podgorica airport to Perast, Risan, Dobrota and other small places which belongs to Kotor area is also popular transportation request. Kotor old town is one of the best preserved medieval old cities at the Adriatic. 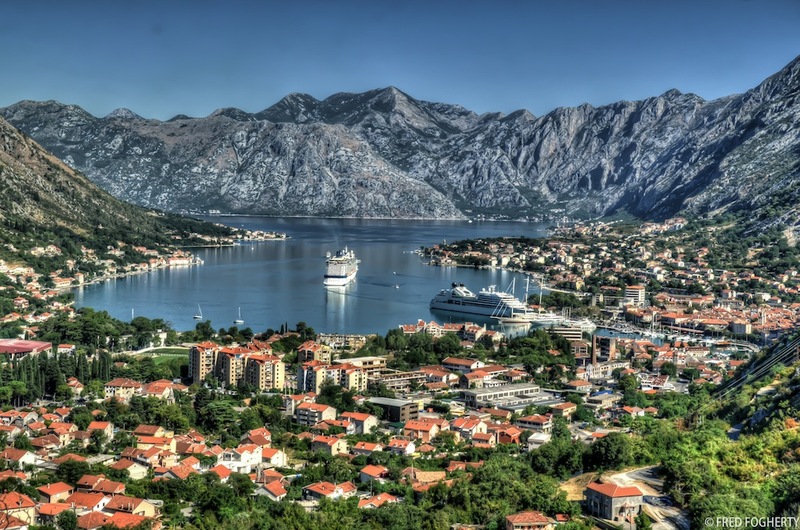 In 2013th year, 409 big cruiser boats entered in Boka bay, and visit Kotor old town, which is UNESCO World Heritage Site. Taxi from Podgorica airport to Kotor with licensed taxi drivers and comfortable vehicles, covered by insurance policy, is advantage comparing with tourist agencies and hotel transportation. Our driver will be waiting for you at the airport exit, holding a board with your name, and he will provide you with excellent and cheap service taxi from Podgorica airport to Kotor bay. All drivers are professional, and each of our drivers is at least ten years taxi driver. Our vehicles are new and comfortable, with a big trunk, adjusted for airport transfers. In the case that you did not book your return ride from Kotor to Podgorica airport, you can arrange it with your driver. Transfer from airport Podgorica to Kotor can be booked through our contact form, or by phone +382 67 246 109 or to text us at the same number. Our customer phone line is in Podgorica - Montenegro, and it is available 24h daily (English and Montenegrin language) for scheduling all kinds of transportation from airport Podgorica to Kotor. 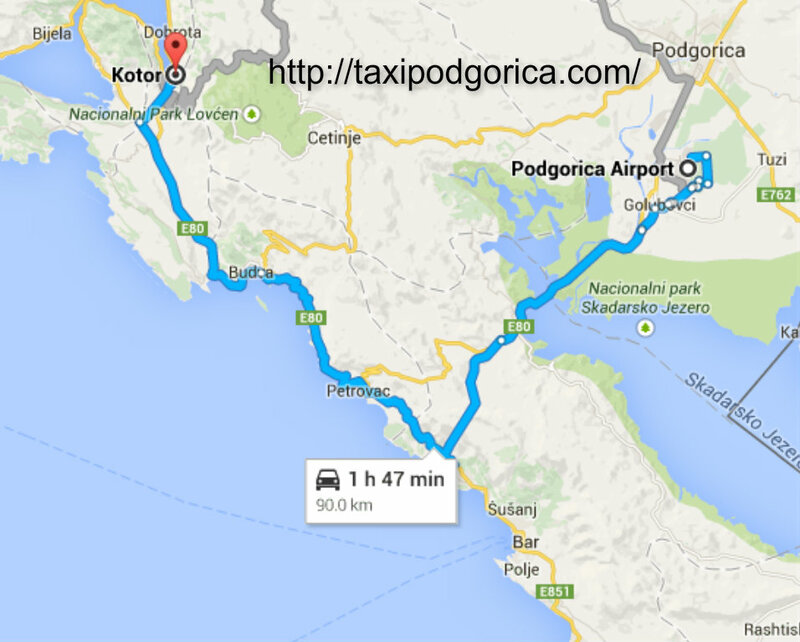 Distance from Podgorica airport to Kotor is about 90 kilometres, and ride usually takes 1 hour and 30 minutes. You can choose between two directions, via Podgorica and Cetinje, or via Petrovac. If you want to make your journey more exciting, we can suggest transfer from Podgorica airport to Kotor via Cetinje and by old road directly to Kotor. This is the longest road, but with great views of the entire Bay of Kotor. Schedule in advance online taxi from Podgorica airport to Kotor. Transportation cost 55 eur, one way, and it is fixed during the all year. There is no additional costs - taxes, VAT and insurance are included in the price of 55 eur per vehicle, 1-4 persons with their luggage. This video is from our official Youtube channel, and you can see main entrance in Kotor old town, the most frequent drop of location in our taxi rides from airport Podgorica to Kotor.